Joe Feeney, was an Irish Tenor on the Lawrence Welk Show from 1957 to 1982. Feeney was born in Grand Island, NE on August 14, 1931. Feeney studied music at St. Benedict's College in Atchinson, Kansas where he appeared in many college productions and Omaha, Nebraska radio stations. Feeney also won a spot on the Arlene Francis Show "Talent Patrol" before joining the Lawrence Welk show in 1957, replacing Gene Pursell, a and, a few years later, Canadian tenor Maurice Pearson. Feeney stayed with the show until 1982. 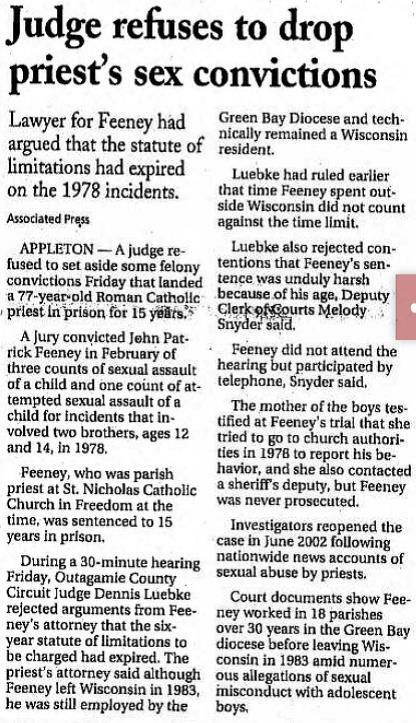 In 2004, a jury found Joe Feeney's brother, John Feeney, guilty of child molestation while he was a priest for the Catholic Church in the 1970's and 1980's. A jury also found the Catholic Diocese of Green Bay responsible for negligence for not investigating multiple complaints against Feeney. After getting remarried and moving to Mexico in 2000 to avoid IRS tax liens, Joe Feeney passed away in April 2008 at the age of 76 from emphysema.